So, it's summer here and with two teacher parents and two toddlers, we have officially done more dishes in the past 2 weeks than in the past 2 months combined ;) Ok, that might be a slight exaggeration, but you get the gist. Eating at home is great - you can choose much more healthy options and really watch what you consume. We do our BEST to eat whole foods with very little processing, but honestly, it gets hard when you are trying to cram fun stuff in the day, too. So, with that in mind, I'd like to show you a lunch that I have fed my girls this week with natural options that are easily accessible at the grocery store, take less than 5 minutes to prepare and my girls totally clean their plates. There are TONS of options for nut butters (or seed butters if you have a nut allergy). This particular butter is from Whole Foods, but you might also try Jiff's Natural Creamy Peanut Butter (hydrogenated oil free) or Sunbutter, a Sunflower Seed spread. My favorite bread is this recipe from Wholesome Mommy, an awesome home made honey wheat bread. Be sure to let it cool completely before you slice so that it doesn't smush for sandwiches. (Confession, this is not home made bread in the photo - I am trying to clean house today for company this afternoon and haven't had time to bake). Check out this awesome link for a list of Non-GMO condiments (including butters and jellies). Try this cheeto-esque chip that even Daddy Drew approves of. Non-GMO verified, baked products that are far more healthy than the alternative and tastes good, too! This time it is an organic banana, sometimes it's strawberries, sometimes apple slices, sometimes orange slices... whatever you prefer, get those fruits and veggies into the diet! We eat fruit with every meal AND for snacks! I love anything from Trader Joe's, but you can find Kale Chips anywhere... even on Amazon! You might try baking your own, too! Wash and dry your kale, lay out on a cookie sheet and drizzle with olive oil and salt. Bake at a low temp until dried! So easy! I try hard to serve something green at both dinner and lunch. Another thing my kids love is raw broccoli with a dip. To save time, I clean and cut the broccoli when I bring it home from the grocery store and store it in a container in the fridge for easy access. Lunch time is a great time to have the kids help in the kitchen, too. Allow them to spread the peanut butter or choose what to put on their plate (with supervision of course). I also highly recommend that you teach your children to clear their spot at the table when meal time is through. This is an age appropriate chore that is simple to do and instills a confidence and work ethic in your kiddos from a young age. 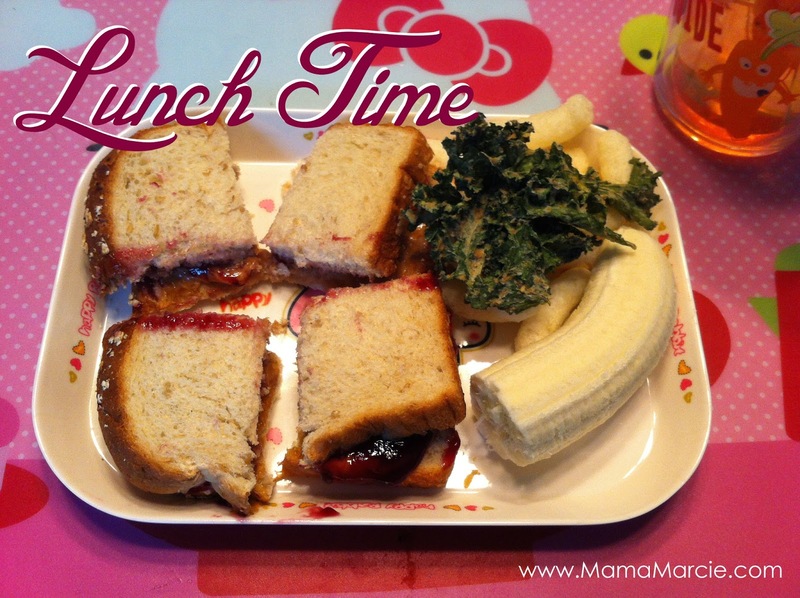 What is YOUR favorite thing to serve your kids for lunch?